Hi friens! I hope you all had a marvelous weekend! I did a talk at One Yoga Saskatoon as part of our 40 Days of Yoga Challenge that was all about some common issues you can face when you’re undertaking a change in your diet and lifestyle. I thought I would share the fruits of that labour with you here on the blog, so I’m going to be breaking it down into a few posts over the next couple of weeks in order to help set you up for success. Here we go! There are lots of different places resistance can crop up. Knowing some of the most common areas will be incredibly useful in helping you pinpoint where you are struggling. 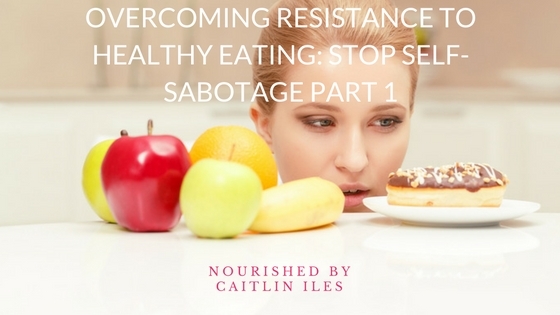 Of all the types of resistance I’m covering in this series this is likely the one that has the most potential to hold you back and keep you from making lasting change to your diet. You likely know exactly what you need to do to get healthy, but when you try to do it you probably sabotage your own efforts when you start getting close to success. This is because food and eating are charged with emotions, memories, and, oftentimes, moral judgments. You probably see certain foods as inherently good or bad. However, the food itself is neutral. It’s humans who place foods into these categories and by extension you can end up defining yourself as good or bad depending on whether or not you were able to resist a particular food. You are not a bad person if you eat junk food, just like eating a clean diet doesn’t make you a good person. Taking the moral judgment off of your plate is an integral first step towards making lasting change. You will also likely create stories about yourself and the way you eat that become self-fulfilling prophesies such as “Oh I’ve always been a little overweight no matter what I eat, so I don’t even bother.” Or you might subconsciously believe that you are a “bad” person based upon emotional wounds you received as a child and so you may “punish” yourself by eating poorly. Changing this type of thought pattern is not easy, but it can be done. The biggest tool you have in your arsenal when it comes to fighting resistance is mindfulness. Recognize when you start reaching for the cookies and think about why you’re going there. Get quiet and listen. Pick up a pen and paper and just start writing without thinking. Eventually the more you do this, the more insights you will gain into why you constantly fall into the habit of self-sabotage when it comes to your diet and eating patterns. Remember that if you eat something that doesn’t necessarily promote optimal health for one meal, one day, one week, or even one month, it is NOT the end of the world. It just means that you have the chance at your next meal to eat something a little healthier. Take it one meal at a time and do not berate yourself for any perceived slip-ups. Ultimately it is just food. It should bring joy, pleasure, and satiety. Not guilt, shame, or illness. Be mindful and choose what’s best for you in the moment. Well that’s part 1 of my Stop Self-Sabotage Series! Stay tuned for Part 2 where I’ll dive into some of the most common self-sabotaging thoughts you may tend to have. If this topic is resonating with you make sure you download my FREE Stop Self-Sabotage Workbook by clicking here. Have a beautiful week!! Read Part 2 and Part 3 and Part 4 and Foods to Avoid and Clean Eating Guide!